New generations of high definition day/night CCTV cameras offer a step change in performance from models previously available. They enable operators to zoom in and clearly identify faces, number pates and suspicious activities. Rosahl micro dehumidifiers use a solid state ionic membrane that is long lasting and requires no maintenance, making it perfect for external CCTV cameras, sensitive electronics and photographic equipment. As it is also silent and vibration free it will not affect picture quality. The ultra compact devices (~25% the size of an AA battery) run from a 3V dc supply with an average current draw of 80mW, depending on the ambient humidity. It may be controlled using a humidistat or allowed to operate 24/7. The low power drain means it can also be driven by photo voltaic (PV) systems in remote locations. 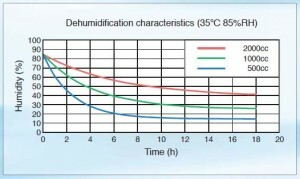 The curve below is an indication of typical drying performance in volumes of free air up to 2 litres.